There will be no snow tubing for the 2018/2019 season. 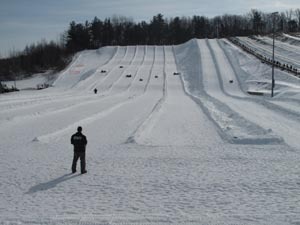 Amesbury Sports Park is New England's first snowtubing park. They make snow, and there is one magic carpet lift and one rope tow to bring guests to the top of the hill. Hop on your tube, take a ride up the hill, then down you go. Bring your helmet! Kids helmets are available to rent for $3 or you can bring one from home. Kids 4 - 6 are required to wear them. • The steepest snow tubing hill in New England! • A conveyor lift and a handle tow lift so you don’t have to trudge up to the top of the hill. Warm up at the Corner Kick pub, where you can watch live sports, order a meal or watch your child/family from the comfort and safety of warm surrounds. Children 4 through 6 must be accompanied by an adult, parent or guardian (over 18), at all times – minimum one adult to one child ratio. Children 7 years old and 42 inches tall or taller may ride by themselves. It is mandatory that the child wears a protective helmet while snowtubing. If the child does not have his or her own helmet, one will be provided free of charge. Helmets are optional for 8 & above but are not available at the ticket office. You must bring your own. Thursdays Special - 3 hours of snow tubing for just $20! The Thursday night special is not available during school vacation weeks or holidays. *Not valid with any other discounts or offers. Take Rte. 95 North- Exit at 58B (Rte 110 Amesbury). Travel 1 mile and then get onto Rte 495 South . Get off at the very next exit, exit 54. At the bottom of the ramp make a left and take the first right onto South Hunt Rd - we are located 1/4 mile on the left. Take Rte 128 (95) north to Rte 93 north. Then take Rte 495 north to exit 54 (Rte 150 Amesbury). As you approach the ramp we are visible out of your right window! At the bottom of the ramp, drive across onto South Hunt Road - we are located 1/4 mile on the left. Take Rte 495 north to exit 54 (Rte 150 Amesbury). As you approach the ramp we are visible out of your right window! At the bottom of the ramp drive across onto South Hunt Road - we are located 1/4 mile on the left.